MOSCOW, August 1. /TASS/. The Izh motorbike of the Cortege project, which is now being implemented by the Kalashnikov corporation, will be on free sale both in Russia and abroad, head of Rostec corporation Sergey Chemezov told reporters. "In this regard, we do not make distinction between the markets," he said. "We plan free sales of the motorcycle, which will be placed on the market under the Izh brand. This brand has been known since the Soviet times, now it belongs to our Kalashnikov corporation, which is working on the new vehicle. But it is difficult to say if this motorbike will repeat the one of the Cortege. But it will use design and technical solutions that are used in a motorcycle for the Cortege project, "Chemezov said. Earlier, Chemezov said that the motorcycle tests would not be completed before 2019. Only after that its serial production will be discussed. In May, the head of Rostec told President Vladimir Putin that the motorbike of the Cortege project is almost ready, but it still needs some adjustments. According to him, the motorcycle, which turned out to be "very beautiful," is not inferior in performance to Western equivalents. In response Putin said that it should become better than foreign ones. The Izh motorbike can accelerate to 100 km/h in 3.5 seconds. It has 2900x940x1250mm dimensions and a weight of 510 kg. The concept bike can develop a maximum speed of 250 km/h and has a torque of 180 nM and an engine capacity of 110 kW. 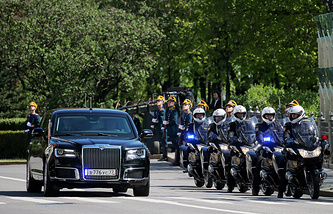 This motorbike was developed for the Cortege project, which implies building a family of cars for Russia’s top officials. The Kalashnikov Corporation is Russia’s largest manufacturer of a wide range of small arms. At present 51% of the company's shares belong to the state corporation Rostec. The company's products are exported to more than 20 countries.